Thank you ICP,NWA All-Stars, CWF Mid-atlantic, Dukes of Hazzard Festival crew and most of all…all of the girls who participated. It’s an amazing opportunity to travel and work with your friends. Amber O’neal and the Arenachicks documented the summer tour and it will be released in a few months. Here is a preview trailer from footage we filmed during this amazing experience. Here are the results and highlights from Arenachicks July 28 2012 tapings as well as some pretty exciting news for Arenachicks future…. Shelly Martinez came out and kicked off the arenachicks summer tour 2012 and announced she has been appointed commissioner of Arenachicks and talked about what she would do to take Arenachicks to the next level. Her first job appointed as commish was to get this final four tourney moving a little faster so she announced Arenachicks had to withdraw Sara Del Rey from the final four tourney due to her recently landing a deal with the WWE(gave a congrats to sara and crowd applauded all wishing Sara good luck) so therefore whoever won between Amber O’neal VS Reby Sky would advance. Reby Sky defeated Amber O’neal due to interference from Jazz. Jazz hit Amber with a Jazz-stinger and Reby pinned Amber off of Jazz finisher. Reby is now 2nd entry into the final four tourney. Angel Orsini won the 1st entry. Jazz VS Rosita was 5 star womens wrestling action. A MUST SEE!! Jazz defeated Rosita with her sit out slam advancing to the final four tourny as well. 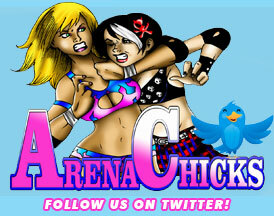 Tuesday July 30 2012 Shelly Martinez & Amber O’neal did a special pre-taped episode of H2H (Highway to Helms show) were overjoyed with the latest Arenachicks NEWS announcing Arenchicks will start doing ippvs later this year. They will annouce the first ippv date in sept or oct and the first Arenachicks Champion will be crowned. This episode will air this weekend. Arenachicks LIVE action is back in full effect. We are proud to annouce the following two matches will be filmed for our ARENACHICKS LIVE VOLUME 3 DVD “ROAD TO THE FINAL FOUR” along with backstage vignettes and promos will take place this Saturday July 28th in Gibsonville, NC in the brand new CWF Mid-Atlantic Sportitorium. All info for this event is below! It’s the first ArenaChicks appearance for the well traveled Sky facing off against CWF’s most dominant female wrestler of all time! Arenachicks is proud to annouce on July 28th 2012 in Burlington, NC at CWF-Midatlantic Sportitorium the 3rd Arenachicks Final Four Qualifier Match…ROSITA VS JAZZ w/ SHELLY MARTINEZ as special guest referee! Who will place as the 3rd entry in the Arenachicks final four tourney as both of these women have proven to be two of the best in the business today worldwide. Angel Orsini was the first entry as she defeated 3 other Arenachicks in a 4way elimination match and Sara Del Rey defeated Mia Yim for the 2nd spot. More info coming soon. We want to thank all the INCREDBLE fans we were so lucky to at WrestleReunion VI in Los Angeles! You fans are just so supportive in our venture to bring women wrestlers into the spotlight both in the ring and at personal appearances. WrestleReunion is such an awesome convention and we cannot thank them enough for all their support as well. Our “mini-show” was a big success and we appreciate all the VIPs that attended, cheered and we are so thankful we got to meet everyone too! We have hardly recovered from the grueling trip and our schedule in LA but now we are moving forward to perhaps our BIGGEST convention ever… WrestleReunion VII in Miami during WrestleMania weekend! Not only have we confirmed that Shelly Martinez will be appearing for us, we can also confirm Angel Orsini, Fantasia, Sassy Stephie, and Amber O’Neal. But that is not all… some REALLY BIG NEWS is about to be announced about Miami and we hope all you fantastic fans are going to support this huge undertaking as well! Miami Beach here we come!!! Be sure to visit WrestleReunion.com to get details on the convention weekend and look for a special announcement to be released soon!!! Arenachicks is very proud to announce our newest additions joining the Arenachicks Vendor at Wrestlereunion Jan 27-29 in Los Angeles, CA! Sassy Stephie, Fantasia, Buggy Nova, and Davina Rose will be signing autographs, selling merchandise, and will also be available for photo-ops. These four talented ladies will also be performing in the LIVE Arenachicks Mini-show that will be held Friday afternoon at 1:30-2:30 along with Angel Orsini, Amber O’neal, Becky Bayless and Shelly Martinez exclusively for VIP PACKAGE GUEST ONLY. This will filmed for the soon to be released DVD “Arenachicks Go To Hollywood” that will also include a behind the scences documentary bonus DVD as well. We will be announcing more surprise special guest next week. Dec 17th at CWF Mid-atlantic Battlecade the first taping for Arenachicks VOL 3 took place. First match filmed for the upcoming DVD was Amber O’neal & Becky Bayless in mixed tag action! Becky Bayless AKA former TNA Knockout Cookie teamed up with CWF Mid-atlantic Star Trevor Lee to face CEO of Arenachicks Amber O’neal and PWI International Ultra-J Crown Champion “Midnight Sun” Caleb Konley. In a match that kept the crowd entertained from bell to bell the guys went hard and fast & the Arenachicks went for keeps & on a couple occasions when the two genders were in the ring together, it left the crowd oooohing and ahhhhing at the impact of crumbled bodies on the canvas. O’neal landed a few high-flying moves on Lee and Bayless just HIT Konley and O’neal every chance she got as she was NOT the the crowd favorite on this imparticular night in Burlington,NC. Amber O’neal & Caleb Konley won the affair with Amber hitting a high cross body on Trevor Lee for the 123! This match was fast paced, hard hitting and hilarious leaving the audience very pleased with this match up. The “Queen of Wrestling” Sara Del Rey VS Mia Yim with the winner advancing to the ARENACHICKS FINAL FOUR TOURNY was the match that left everyone in the crowd and locker room not doubting for one second..WRESTLING IS REAL..with the realest, most vicious kick exchanges ever seen in the CWF Mid-atlantic Sportitorium! This match was back and forth and equally matched move for move. Yim stayed very alive looking as if she was going to make “Death Rey” tap as the crowd agressively chanted TAP,TAP,TAP.. but Sara was able to fight out of the submission and reverse it into the Royal Butterfly Suplex that landed Sara Del Rey so many wins on her impressive resume…proving once again why she is “The Queen of Wrestling” and advancing to the Arenachicks Final Four Tourny where the first ever Arenachicks champion will be crowned. Mia Yim accepts Sara Del Rey’s challenge! ArenaChicks.com is proud to announce TWO feature matches that will be a part of CWF Mid-Atlantic’s anniversary event, “Battlecade XII”, this Saturday night (December 17th) in Burlington, NC. “The Queen of Wrestling” Sara Del Rey recently appeared on “Fire & Ice” radio program where she threw out an open challenge to anyone to face her in an upcoming bout. Sara has stated that if the ArenaChicks are going to crown a champion, she had to be included in the tournament. Del Rey then stated that she would face anyone that was brave enough to step in the ring with her, with the winner moving on to the Final Four of the Arenachicks Title Tournament. Arenachicks CEO Amber O’Neal quickly heard from rising sensation, Mia Yim, who has been looking for an opportunity to get in the ring with Sara Del Rey. “It was an easy challenge to fill as Mia Yim has not only wanted to appear for Arenachicks, but has been patiently waiting for the chance to fight Sara Del Rey,” stated O’Neal. This incredible first-time matchup will take place this Saturday along with a mixed tag team bout featuring Amber O’Neal & Caleb Konley taking on Becky Bayless (Cookie) & Ben Tyler.